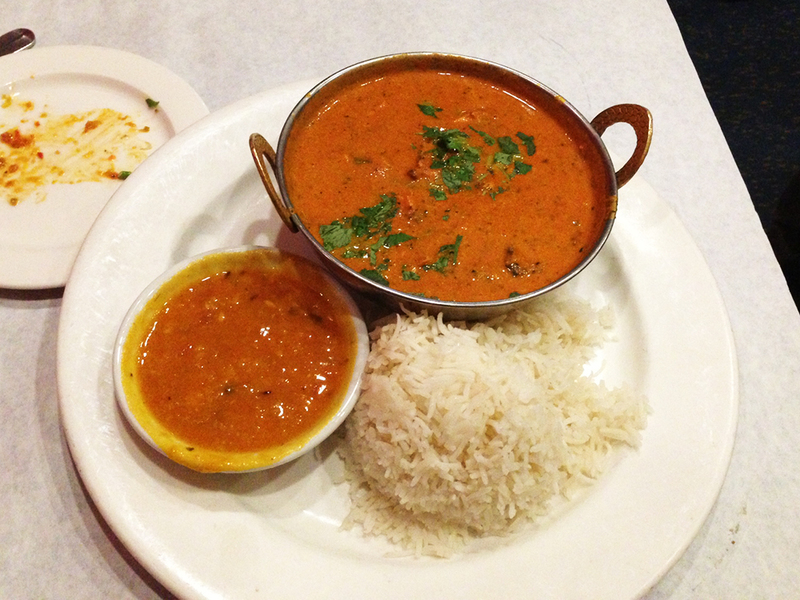 I love Indian food and almost always enjoy it whenever I have it. That gave Rasoi a pretty good base of expectations to meet on my part. When I found out that the owner of Kabob and Curry, Sanjiv Dhar, also owned Rasoi, the bar for excellence went even higher. The reason I had high expectations going in to try Rasoi is because the first time I ever had Indian food was at Kabob and Curry on Thayer Street in Providence, RI, when I was a young teenager in the mid 90’s. Since that time it has always held a place in my heart as the restaurant that opened my eyes to Indian food. I have always thought that Kabob and Curry was an excellent Indian restaurant despite some nay-sayers that proclaim other RI establishments as the top Indian dog. 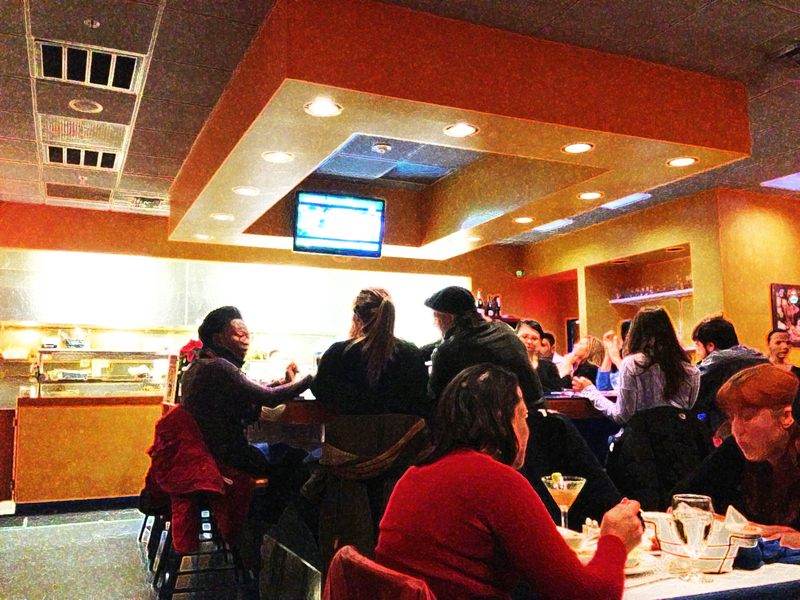 I think it’s simply a matter of new vs. old, where some people prefer a newer restaurant to an established one. Regardless, Rasoi is both relatively new (it opened around 2009, I think) and comes from a tradition of wonderful food. Compared to Kabob and Curry, which is much more “traditional” and perhaps stereotypically Indian in decor, the interior of Rasoi is much more modern looking. 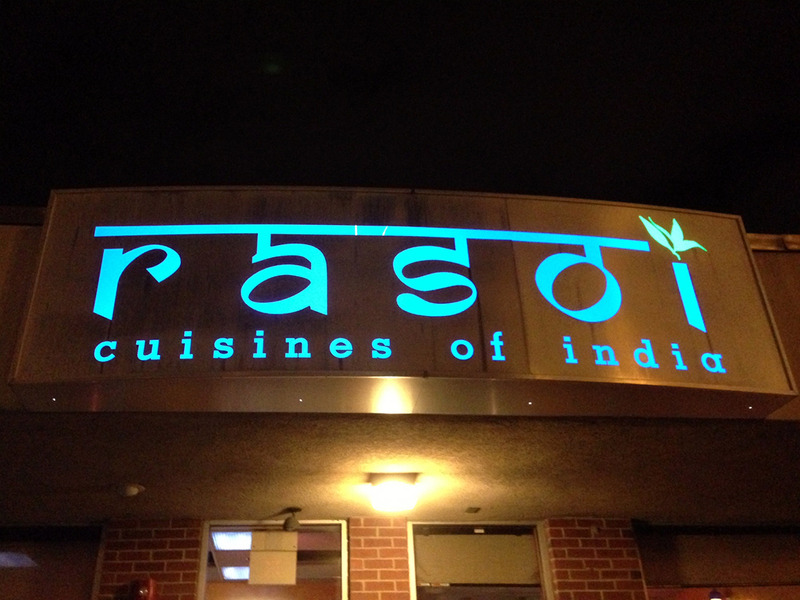 Located in what is essentially a strip mall in Pawtucket, one might miss Rasoi altogether if not going there on purpose. Nonetheless, once inside, the restaurant looks very modern with an open kitchen (“Rasoi” actually means “kitchen” in Hindi), a bar in the center of the restaurant, and an open space for tables around the bar. Don’t let that fool you though because even if the decor is more modern, the smells emanating from the kitchen are all classic Indian. The service at Rasoi is courteous, prompt, and friendly. At the start of the meal, our server brought us a basket of Papadum, a crispy, cracker-like bread, often spiced with cumin and black pepper then served with a chutney. 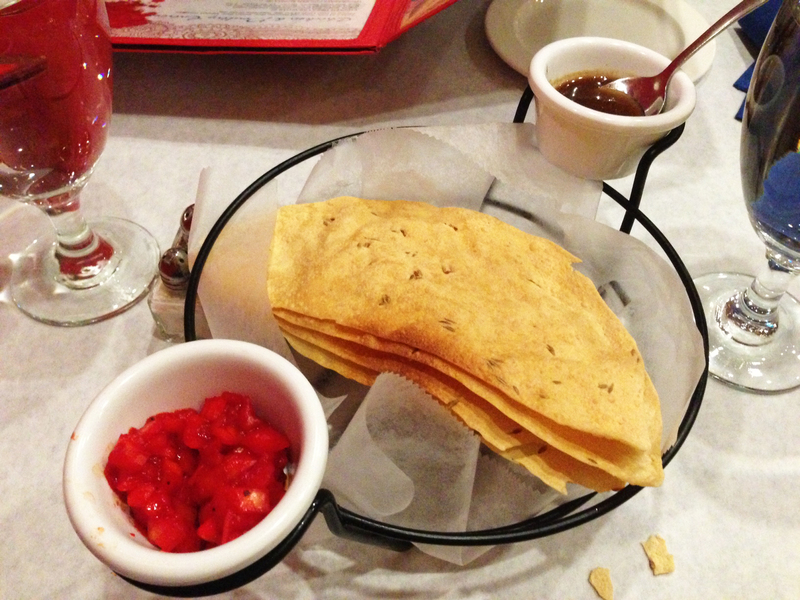 The Papadum tasted good and made for a nice start to the meal by setting up some of the flavors to come. One of my personal favorite chutneys is the spicy onion chutney (the one closest to the viewer in the picture below). I first had this in the mid-90’s and I’ve been hooked ever since. Sometimes I go out of my way to order something that comes with this chutney, just so I get my fix. Rasoi also offers a modest cocktail menu that combines exotic flavors with more domestic ones. I tried the vodka, basil, and lime infused cocktail, which was fantastic. 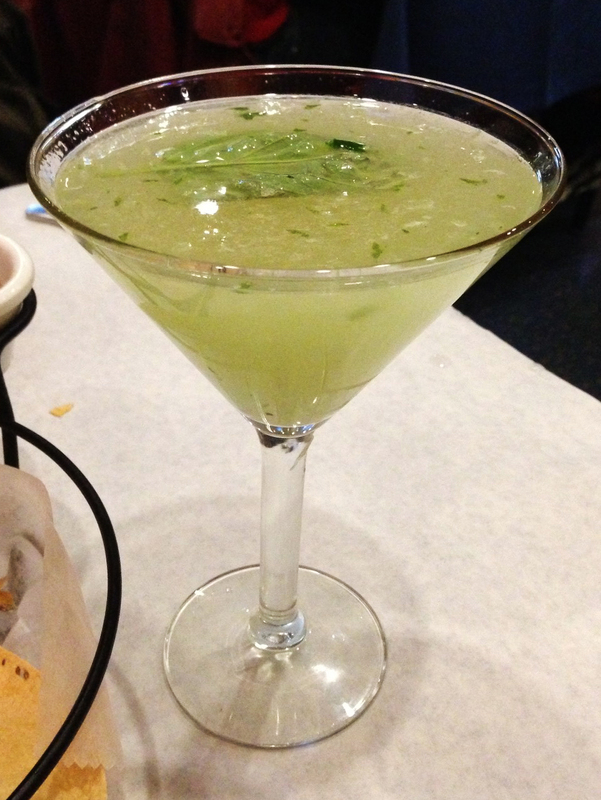 It tasted like a sweet limeade accented with hints of basil. It could be the dead of winter and this cocktail will mentally transport you to sitting on a front porch in the middle of the spring or summer. As an appetizer, my fiance suggested that we try the “Cauliflower 65,” that she had tried before. I was skeptical because, well, it was cauliflower. Don’t get me wrong, cauliflower is great at home, but I get suspicious when paying for it in a restaurant. When it came out, I was surprised because it looked exactly like a fast food Chinese order of General Gau’s Chicken (General Tso’s if that’s your preference). Not only did it look the part, it tasted almost exactly like General Gau’s chicken due to it’s battered, fried exterior, and sweetly spicy coating of sauce. The only real difference was the quality (perfectly fried and not overly battered) and cauliflower interior. This appetizer gave me my first impression of the restaurant, which I began to realize was a more modern take on the more traditional Indian cuisines. I thoroughly enjoyed my “General Gau’s Cauliflower” as I began to fondly refer to it from that day on. 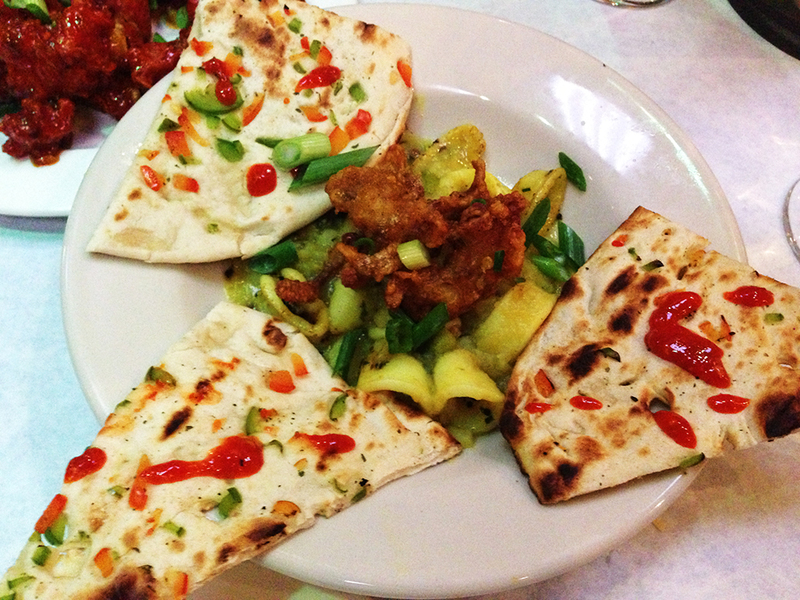 Another appetizer we tried was Rasoi’s take on calamari, which I believe was a special instead of a normal menu item. The calamari was unlike any I had ever tasted. The calamari was cooked excellently, but the spices were unexpected in a good way. The sauce coating the calamari was a sweet and spicy mango-like infusion that went really well with the calamari, which absorbed the flavors well without losing its own flavor. The naan (Indian flat bread) that accompanied the dish was excellent although unnecessary when the calamari itself was so interesting. Over the span of a few visits, I tried a few different entrees. 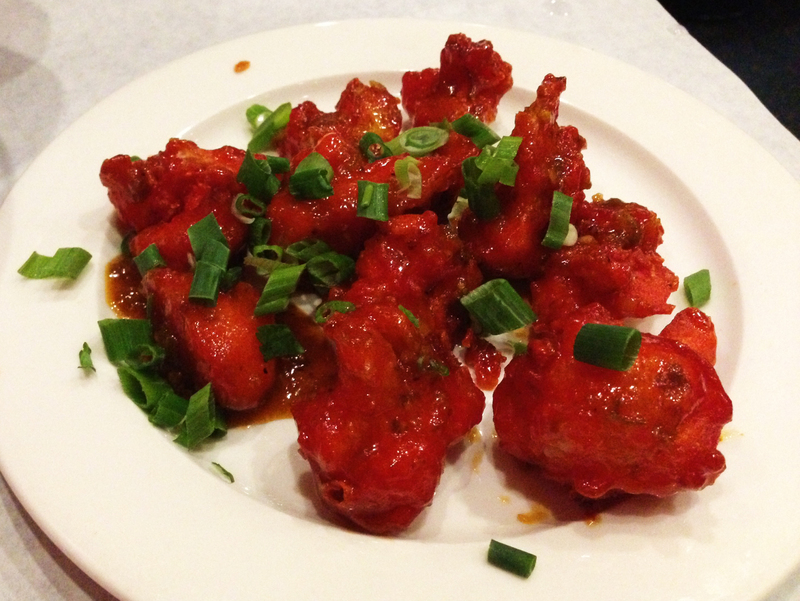 I had the chance to try one of Rasoi’s more popular dishes – Chicken Tikka Lababdar. After a bit of research, it seems like chicken tikka is like a boneless, braised, kabob version of tandoori chicken. The lababdar portion of the dish takes the chicken and places it in a spicy tomato-based sauce. I enjoyed the chicken and found that the sauce went really well when combined with the plain steamed rice. The mild rice absorbed the flavor and cooled off some of the heat from the sauce. The chicken marinating in the sauce was also pretty good although the perfectly shaped cubes of chicken were slightly overcooked, which made them very firm. Generally, this was a nice dish accompanied by white rice and a small side of cumin-laced lentils (I prefer their side of chickpeas), but it didn’t blow me away. My go-to dish at any Indian restaurant is Saag (a creamy and spicy spinach dish containing, chicken, lamb, shrimp, tofu, or cheese cubes depending on your preference). I enjoy most Indian food, but Saag is my favorite because it just combines so many different flavors perfectly whether spicy or mild. It seems simple enough, but it does take skill to balance the ingredients so well. The green of the spinach adds an entirely complimentary dimension to the traditional Indian spices. The meat, seafood, cheese, or tofu cubes in the saag are somehow able to maintain their own delicious flavor while still combining with the dish. At Rasoi, they make a wonderful saag. I’ve had the shrimp saag there and the mild flavor of the generous portion of shrimp went wonderfully with the saag, but even if I ate a piece of shrimp on its own, I could taste the shrimp’s own flavor profile. I thoroughly enjoyed the saag at Rasoi and will definitely order it again. 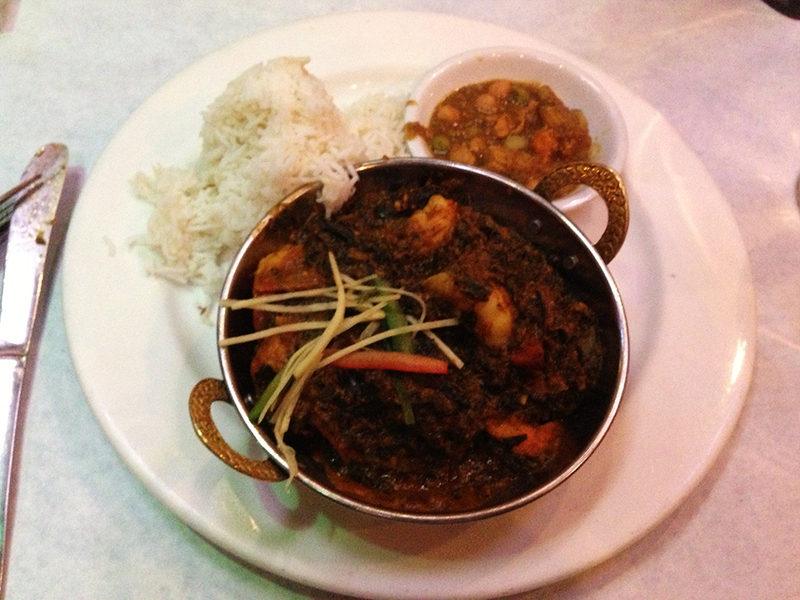 Rasoi is an excellent Indian restaurant that does justice to its predecessor, Kabob and Curry in Providence. Rasoi’s modern take on Indian cuisine makes for visually pleasing dishes that deliver on traditionally Indian flavors fused perfectly with foods from other locales. Highly recommended as one of the better Indian restaurants in RI. The food looks good and although the interior looks a bit too modern for my taste it is the food that is the most important after all. Just one note – Saag is not exactly spinach. Spinach is palak, not saag. Saag is a bit different than spinach. Some restaurants make their saag with spinach though, I think. I’m fairly certain that on many menus, the dish is called saag (whether correctly or incorrectly), but the ingredients use a spinach base. In either case, it’s delicious!